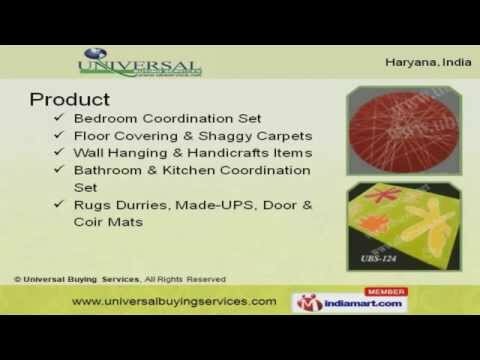 Welcome to Universal Buying Services, Buying Agent of Home Furnishing Products. The company was established in 1999 at Panipat. Our Ethical business practices and Excellent Industrial relationships make us unique in the industry. Market leading prices, excellent logistics facilities and Total customer satisfaction help us to achieve an unrivalled position in the industry. Our product list covers Floor Covering, Wall Hanging and Handicrafts Items. We offer a wide assortment of Bedroom Coordination Set that are extremely reliable. Our organization is instrumental in offering a wide gamut of Floor Covering and Shaggy Carpets. We also provide Wall Hanging and Handicrafts Items that are some of our best selling products. Our clients can avail from us an exquisite range of Bathroom and Kitchen Coordination Set. Along with that we offer Rugs Durries, Made UPS, Door and Coir Mats that are a class apart.